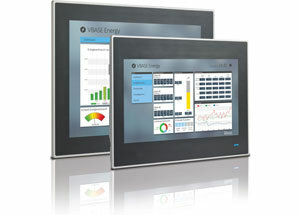 HMI and operator touch panels powered by VBASE. The cockpit for the productive machine. Sovereign operation & monitoring with VISAM Touch Panel. The devices of the VISAM Touch Panel Series (VTP) are extremely compact, yet powerful control units for machine and plant construction as well as for building automation. 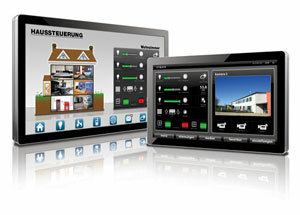 All VTP's have a high-quality color TFT with integrated touchscreen. The display sizes are scalable from 3.5 to 32 inches, depending on the class. For the extreme conditions in industrial applications, the control units are equipped with front protection (up to IP66) and defy splash water and dust. The mechanical design without fans and moving parts makes the units very reliable and low-maintenance. The devices are also ideally suited for use under strong vibrations and shocks. The full SCADA functionality also on your operator panel. The VBASE Editor is used as software for configuring and parameterizing the operator panels. 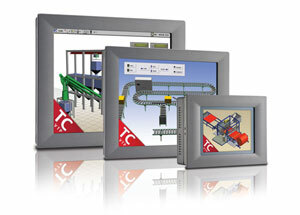 Thanks to the consistent use, you have complete access to the HMI and SCADA world with the VBASE Editor. 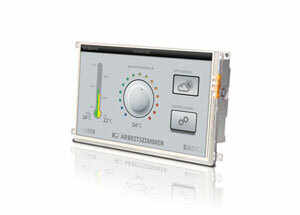 The range of functions of the operator panels differs with regard to the HMI runtime: Devices with a Windows Embedded Compact (WEC7) have a slightly restricted functionality due to the hardware specification. Devices with Windows 7 / 8.1, on the other hand, offer the complete functionality of the desktop runtime VBASE Pro-RT. 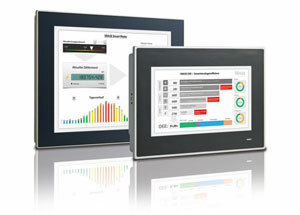 The license for the HMI runtime environment is "embedded" with the touch panel, the configuration software is provided free of charge to all devices. Request our latest VTP price list. Elegant designed control units for wall and in-wall mounting. Industrial panel mount HMI unit with classic design. The VTP's are based on a Harware design, which has proven itself over many years in industrial practice. Thanks to the high connectivity of VBASE, all VTP and VGATE devices are compatible with more than 200 remote systems. These include, of course, the common plc systems of the main vendors. With VBASE Web-Remote, all VTP and VGATE systems have an integrated web interface based on HTML5. This enables the visualization and operation simultaneously via smartphone or tablet.